Brandeis is about giving, about friendship and about fun! It’s about learnng and opening our eyes to the world around us too. We are avid art lovers, readers, movie goers, and so much more. Keep checking this site for links to our chapter photo albums. Visit and revisit the special places our chapter has visited and the wonderful people and things we’ve seen. 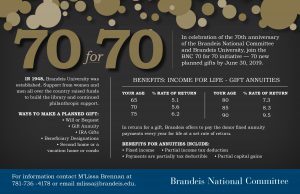 In celebration of the 70th anniversary of the Brandeis National Committee and Brandeis University, join the BNC 70 for 70 initiative — 70 new planned gifts by June 30, 2019. Join an active, vibrant community of like-minded men and women. 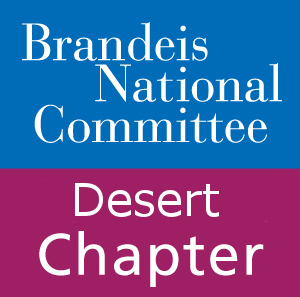 Attend film screenings, book and author events, study groups, University on Wheels lectures with Brandeis faculty, luncheons and more. Feel the pride of supporting the country's only non-sectarian, Jewish-sponsored university. Share YOUR interests.